Teen Science Café Whiteville is situated in southeastern NC, about an hour west of Wilmington. Since it’s a rural area, we see a mix of teens from a variety of neighboring towns and counties. I think this regional diversity makes our Teen Cafés very special. 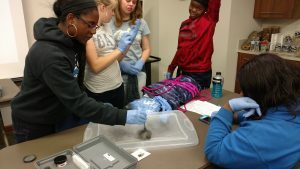 It is an opportunity for students across southeastern NC to come together each month and unite over a common love for science. My background is in STEM education. Before moving to southeastern NC, I was a high school instructor for four years at the NC School of Science and Mathematics in Durham. I’ve always had a passion for educational outreach, and the Whiteville Café Coordinator position seemed like a natural fit for me. When I found the job listing, I literally became giddy with excitement! Teen Science Café Whiteville is part of the Open Minds network of North Carolina. We host Cafés within the Whiteville branch of the NC Museum of Natural Sciences (NCMNS), which is a fantastic venue for these events. The mission of the NCMNS is “to illuminate the natural world and inspire its conservation,” and the Teen Cafés we host at Whiteville mirror that really nicely. Already this season, there have been Cafés on the identification and conservation of birds, bats, and rare butterflies. Coming up in April, a scientist will talk about her research on the relationship between light pollution and sea turtle nesting behavior…and later in May we are going to observe and learn about alligators at Lake Waccamaw! 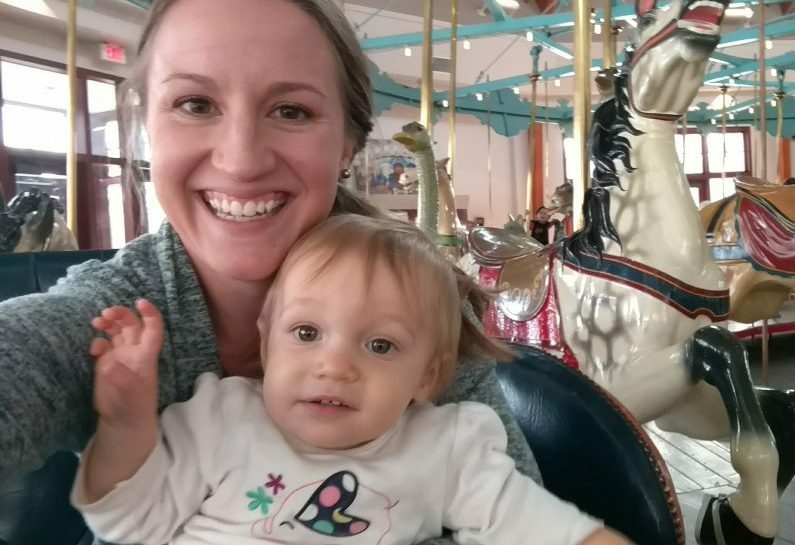 Attendance can be a bit unpredictable, which makes planning for meals and activities more challenging. I just created a new registration link that I’m implementing on a trial basis. At the very least, I am hoping it can provide a minimum head count for Teen Cafés. Fingers crossed! Actually, my favorite Café was just this past month, in March! 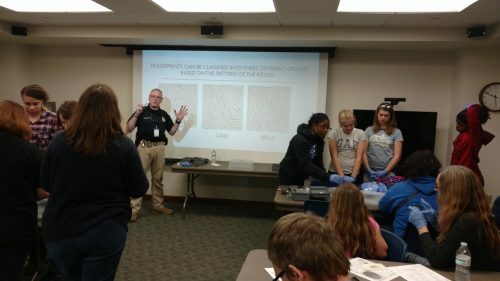 A police detective from Whiteville PD led a Café on “The Forensics of Fingerprinting.” It was extremely interactive and hands-on…the teens took turns leaving behind latent (invisible) fingerprints, and then they dusted the prints with graphite powder to make them visible. Every single attendee got involved, and everyone was able to take home a copy of their fingerprint. 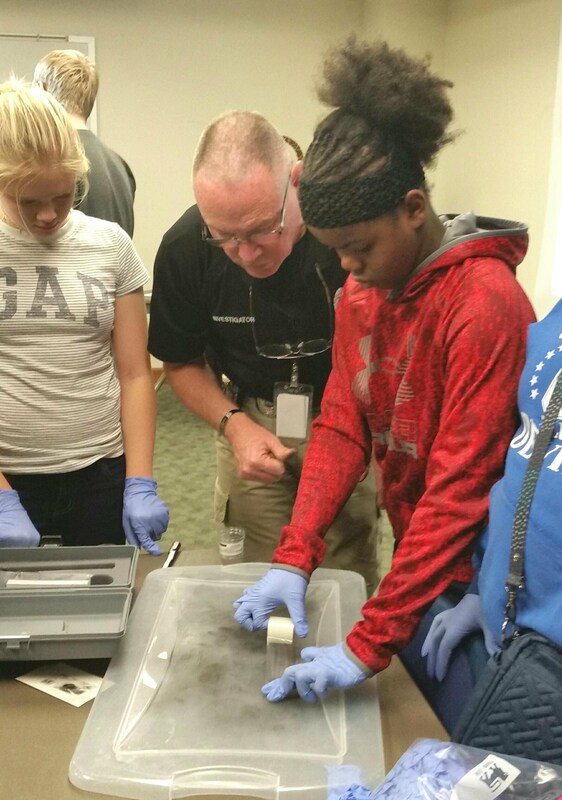 The detective also explained the basics of fingerprint analysis and identification. It was a really fun Café! Easy question! Definitely my group of Teen Leaders who help me run the show: Sean Dooling, Patricia Faulk, Amreen Nagra, Victoria Price, and Anna Prince. They are fantastic! These teens are self-disciplined, smart, ambitious, and just plain fun to be around. They volunteer their time to help me plan the Teen Cafés, and they also show up early and leave late on Café days to help set up and break down–And this is on top of their jam-packed school and extracurricular schedules. I cannot say enough about them. I would just say that the Teen Science Café Network is a great resource to lean on for Café topic ideas and potential speakers. Everyone has been incredibly welcoming to me, and extremely communicative. Help is only an email or phone call away.